King County collects monthly water quality samples on the Skykomish River along the Stevens Pass Highway, just west of the town of Skykomish . King County is not currently conducting benthic macroinvertebrate or stream sediment monitoring in the WRIA 7 Routine Streams Monitoring Program. Approximately 109,000 acres of Foss, Tye, Beckler, and South Fork Skykomish Rivers drain the King County portions of the upper South Fork Skykomish above the sampling site. Land use is about three-quarters forest with very little developed land and no agriculture. There is also some scrub and other land uses (barren land, grassland, open water, and perennial ice/snow), but not much wetlands. Forested lands are predominantly evergreen; and due to the relatively large extent of forest in the basin, some of the healthiest aquatic habitat remaining in King County is in the Skykomish River drainage (King County WLRD, 2001). See Table 1 below for more details on land use. Despite the high quality habitat, the population of Chinook salmon is listed as “threatened” under the Endangered Species Act (ESA). It was last estimated that Chinook in the Skykomish River basin are at about 3.5% of their historic abundance (Snohomish County, 2004). In addition, there are four listed bull trout populations – North Fork Skykomish, Troublesome Creek, Salmon Creek, and South Fork Skykomish – each have populations estimated at less than 100 individuals. By contrast, the basin produces between 25 - 50% of coho salmon in Puget Sound (Snohomish County, 2004). State water quality standards were revised in 2003. 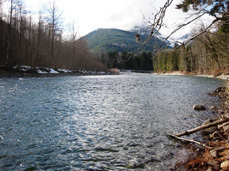 The Skykomish River is now categorized as “Core Summer Salmonid Habitat” for aquatic life use and “Extraordinary Contact” for recreational use. As part of the updated water quality standards, portions of Skykomish Creek have been assigned an additional “Supplemental Spawning and Incubation Protection” temperature criteria of 13 ºC to be applied from September 15th to July 1st. The Skykomish River is not listed on the Washington State Department of Ecology's (Ecology) 303(d) list for impaired streams. A Water Quality Index (WQI) rating system was developed by Ecology that evaluates several water quality parameters and gives a single rating of “high,” “moderate,” or “low” water quality concern. To see how Skykomish River ratings compare with other stream sites, please visit the Water Quality Index webpage. King County is not currently operating any stream, rain, or temperature gages on the Skykomish River. However the U.S. Geological Survey (USGS) does operate a stream gage on the Skykomish near the City of Gold Bar, Washington (12134500). While King County is not conducting benthic macroinvertebrate monitoring on the Skykomish River as part of the WRIA 7 Routine Streams Monitoring, the Washington Department of Ecology collected benthic samples on the North Fork and mainstem of the Skykomish River in 2009 and 2012. To see this data, please visit the Puget Sound Stream Benthos webpage.